The vote on the official CouchDB bylaws started on Monday, July 21 (see initial email). According to feedback, the bylaws were updated on July 22, it’s now being voted on this revised, current version of the bylaws and the vote is still in progress. Binding votes can be casted by CouchDB Project Management Committee (PMC) members. Still, as this is the first vote of its kind, and this document is foundational to our decision-making process in the future, the CouchDB PMC is asking all active committers to cast voluntary, non-binding votes as well. All votes must be received by 23:59:59 UTC on Sunday, July 27, 2014. If you want to take a closer look: you’ll find the discussion and screenshots here. Question: a CouchDB user has a simple user document containing fields such as gender, age and dates. They want to request these documents by age, or gender, or dates or a mix of these criteria. Is it more efficient to create a single view containing several emits, or to create several views, each of them containing one emit statement? Creating several views may be better, since each one will be slightly faster to search. Also, with one view, it can be easy to get mixed up between different types of keys. Multiple views also allows to split them across design documents, which means they can be built independently and in parallel. Regarding the specific use case described in the question, this user falls in the field of multi-dimensional queries, which CouchDB isn’t suited for. The solution generally is to use couchdb-lucene or even elasticsearch or something similar. Question: Is it better to define one view per design doc? If I have e.g. 8 views for a given person design doc, would they better be placed in one single doc or breaked into smaller units? means that one only has to wait for the one view to finish. The smaller unit will save a lot of trouble, especially when updating the code of large views. On the other hand, if the views are re-indexed independently, then each task is reading the documents out of the database. Whereas if the views are in the same design document, the documents only get read once and then passed to each view’s map function. This may be faster, but also depends on details of the view engine used. 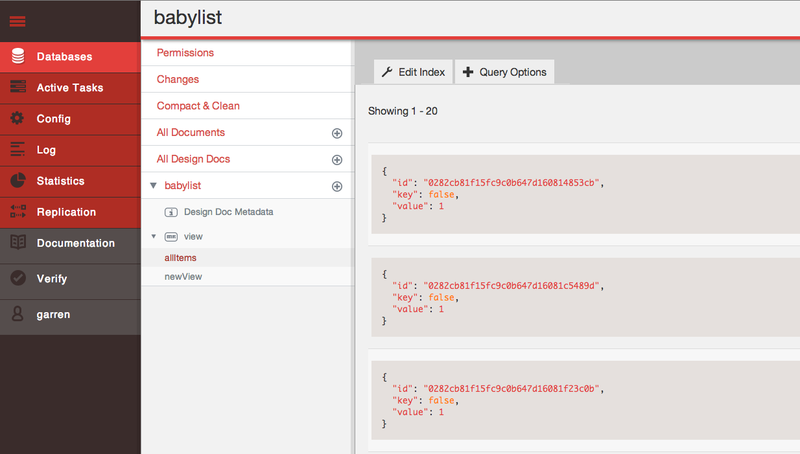 CouchDB and MongoDB: Let our query APIs combine! Stack Overflow: Handle updating documents at the same time in CouchDB? Stack Overflow: Serving file with CouchDB attachment? Posted on July 24, 2014 by Lena. This entry was posted in News and tagged cloudant, couchdb 2.0, design, Fauxton, jobs, query api, releases, vote. Bookmark the permalink.